Last week I spent three days in the suburbs of Chicago, IL. Everything I did was within a 20-minute radius of the airport, and I never got into the city, but...I still had a blast. 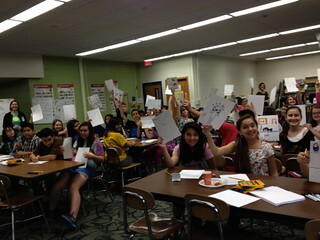 I spent the next day giving a talk and workshops at a middle school in Bloomingdale. 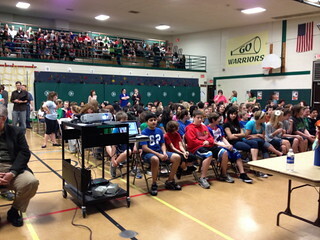 Here they are filing in for the morning presentation...425 students in all! The students had made dolls (out of Pringles cans) based on historical figures for a project, and one girl decided to do ME! 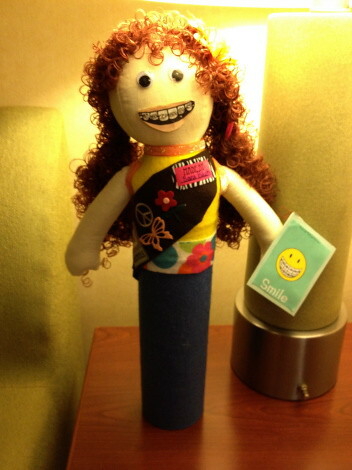 So here's Raina from Smile, complete with glittering braces, a Girl Scout sash covered in badges, and the curly hair I suddenly developed in 8th grade. 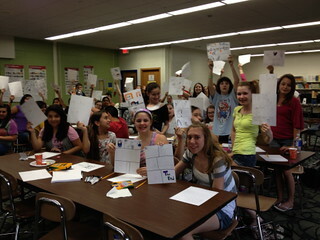 On my final day, I was a guest author at LitWorks, a Teen Read Workshop! 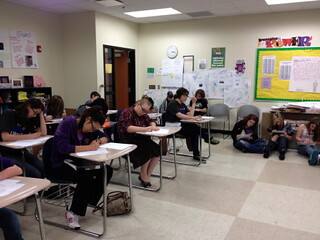 I gave two talks and one workshop--my workshop was so popular I had students sitting on the floor and on top of tables! The workshop got cut a little bit short, but the attendees produced some really terrific comics. I didn't manage to get a picture of myself with the other authors (Carl Deuker, Ron Koetrge, Julie Halpern, and Ellen Hopkins) but they were all wonderful and a joy to spend time with. 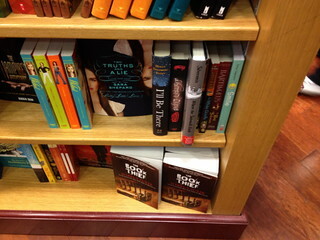 From there it was straight to the airport...but look what I found in the YA section of a bookstore at O'Hare: First airport sighting of Smile (or any of my books), ever!! That was a really proud moment for me, and a nice way to cap off a great trip. Thank you, Chicago! I hope to be back soon!